"The unhappy sons of Israel, so badly treated in other countries, can expect little indulgence from the barbarians ; consequently there is no species of outrage or vexation to which they are not exposed. They are prohibited from writing or speaking Arabic, to prevent their being able to read the divine Koran. They cannot ride on horseback, but are obliged to go on mules and asses ; the first being too noble an animal for them. When passing a mosque, they are obliged to go bare-footed. They dare not approach a well or fountain, if there be a Moor drinking there ; or sit down opposite a Mahometan. Their clothing Is obliged to be black ; which colour is held in contempt by the Moors. The Jewish women are only permitted to veil a part of their features. The indolent Moor, with a pipe in his mouth and his legs crossed, calls any Jew who is passing, and makes him perform the offices of a servant. Others amuse themselves by smearing the hands, visage, hair, and clothes of the Jewish boys, with paint or mud ; while the Turkish soldiers often enter their houses, insulting the females, without the heads of the family having the privilege of desiring them to retire. "It is the business of Jews to execute all criminals, and afterwards bury their bodies. They are also employed to carry the Moors on their shoulders, when disembarking in shoal water. They feed the animals of the seraglio, and are incessantly exposed to the scoffings and derision of the young Moors, without the possibility of resenting it. Frequently beaten by their persecutors, if they lift a hand in their own defence, agreeable to the lex talionis of the Moors, it is taken off. "But that which is still more irksome, is the never ending contributions levied on them : the weekly sum of two thousand dollars is exacted as a general tax upon the whole tribe, besides various other individual assessments, particularly whenever any Moorish festival takes place. The Turks insist on borrowing money even by force ; and contrary to the European maxim, it is not he who forgets to pay, that is incarcerated, but the man who refuses to lend! A Jew cannot leave the regency without giving security to a large amount for his return. If any of the sect become bankrupts, and there happens to be a Turkish creditor, he is almost invariably accused of fraudulency and hung. Woe to those, who attempt to complain on such occasions : which is no trifling aggravation of their sufferings. There was once an imposition laid on fountains; upon which a poet wrote the following address: " You are loaded with imposts like us; but more happy than we — you are at least allowed to murmur." "It is, however, astonishing with what stoical fortitude all this is borne by the followers of Abraham ; many of whom, underan appearance of the greatest poverty, accumulate large fortunes. " It is true," said a Jew, on my asking how he could remain in a country, where he suffered so many vexations; " we suffer a great deal; but then what money we make!!" After the Egyptian military took power in the country 1952, it started its campaign against Egyptian Jews, launching its propaganda against Jews in all the state-owned media. It freed all the terrorists who had committed violence against Jews before the coup, and jailed liberals and seculars instead. It encouraged aggression toward the Egyptian Jewish minority, which led to new terrorist attacks against Jewish individuals and properties in Egypt. The Christian minority in Egypt (known as Copts) reacted in a very selfish way at the time, choosing not to interfere in the crisis so as to avoid any harm. They thought that if they took the side of the dictatorship, they would be safe. Obviously, it didn’t work. 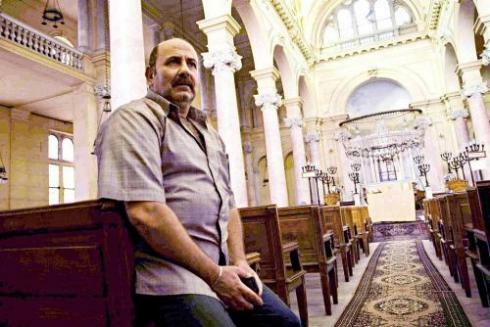 After the Egyptian military expelled Jews and outlawed Bahais and Shias, they started their campaign against Christians. The Egyptian regime has maintained since that time a very fundamental understanding of Islam, and forced it through the media and the education system. Violent attacks against Christians became increasingly frequent, and most of the time no one was prosecuted. The Egyptian regime created an uncomfortable situation for Christians in order to force them to leave the country. And the evidence shows that it worked. Some 4 million Egyptian Christians have emigrated from Egypt over the last 60 years, representing one-third of the entire Coptic population, and comprising nearly 75% of Egyptians living abroad. But Egyptian authorities are not satisfied with that. After Mohammed Morsi acceded to power, he decided to speed up this process. The Egyptian regime used the film “Innocence of Muslims” to start a huge propaganda campaign against Egyptian Christians. And of course, Christians in Egypt are becoming increasingly isolated under this propaganda. Violence against Christians occurs every day, and the state usually takes the side of the Muslim murderers. * These figures are not strictly accurate, and current estimates put Jews in Egypt at less than 50. Deputy Foreign Minister Danny Ayalon's initiative in opening the issue of Jewish refugees from Arab states to public debate has met, as expected, with angry Arab reactions. One of the reactions was the accusation that the issue is an "invention." The reason for these reactions is that this issue has up to now been unknown. Successive Israeli governments ignored it and the media neglected it. It was treated with contempt, amidst the concern that raising it would awaken Palestinian claims and harm the peace process. So the world became accustomed to relating only to the Palestinian nakba that resulted in 650,000 refugees, according to UNWRA, the U.N. agency created specifically to deal with these refugees. The Arab governments are careful to perpetuate the misery of the Palestinian refugees, not allowing them to be rehabilitated or to become citizens in their countries, due to the ideology that maintains that rehabilitating the Palestinians would be to Israel's advantage. The Arab leaders have repeatedly placed full responsibility for the creation of the Palestinian refugee problem on Israel. At the same time, Israel never made a serious effort to exonerate itself of this accusation, even though U.N. Resolution 194 from 1948 did not hold Israel responsible for the problem. Another claim made by the Arabs is that the Jews were not forced to flee from the Arab states, where they lived in peace and harmony. Here, a history lesson of the conflict would be in order. They would discover that, during the U.N. debates in 1947 about the proposal to partition Palestine into a Jewish state and an Arab state, their representatives (Heykal Pasha from Egypt, Dr. Fadhil Jamali from Iraq and Jamal al-Husayni, head of the Palestinian Arab delegation, and others) not only declared that "the partition line will be a line of fire and blood;" they also announced that partitioning Palestine would put the Jewish communities in the Arab states in mortal danger. Immediately after the 29 of November -- the day that the partition plan passed -- the Arab armies and the Palestinian Arab gangs attacked the Jewish community (the Yishuv) in Palestine and, simultaneously, rioted against the Jews in the Arab countries. The war started by the Arabs led to killing, destruction and terrible human tragedy. Eight hundred and fifty-six thousand defenseless Jews fled to Israel and other countries, leaving behind their personal and communal property and assets, while six hundred and fifty thousand Palestinians abandoned their firing positions and their homes and went to Arab countries. In effect, a population exchange occurred between the State of Israel and the Arab countries, similar to the population exchange that occurred between India and Pakistan. However, the Arab states, following the instructions of the Arab League, refuse to recognize this situation and prevent the humane resolution of the problem that they created. Despite the fact that the human dimensions of the catastrophe suffered by the Jews from Arab countries were greater than the dimensions of the catastrophe suffered by the Palestinians, the world's attention has always focused on the latter. The U.N. High Commissioner for Refugees in 1957 did indeed recognize the Jews from Arab countries as refugees, but the U.N. General Assembly did not pass a single resolution on their behalf. In contrast, it has passed more than 160 resolutions and declarations in support of the Palestinian refugees. This one-sided approach has not solved the problem and has exacerbated the Israeli-Palestinian conflict. It could be that the Jewish refugees were ignored because the Jews from the Arab countries rehabilitated themselves in Israel and in other countries and the conditions of their life in the camps became a thing of the past. All of the U.N. resolutions and the billions of dollars donated to the Palestinian refugees by the international community have not improved their situation and they continue to live in appalling conditions. The time has come for the Arab states to acknowledge the reality created by their war on Israel and to stop toying with the possibility of turning back history, stop reciting the slogan "right of return" for the Palestinian refugees and stop sowing illusions in their hearts. A solution to the tragedy of the refugees in the Middle East -- Palestinians and Jews -- can only be found by looking at the total picture. Any solution must be shared by the Arab states, Israel and the international community. It must be based on President Clinton's proposal in 2000, to establish an international fund to compensate Palestinian and Jewish refugees. Ben Youssef Gaon is the last Jewish man in Alexandria. 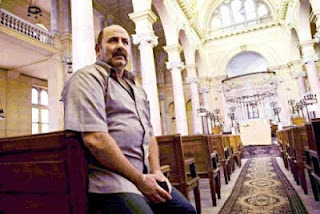 As the president of the Jewish community in the city, he controls huge swathes of property, including synagogues, cemeteries and commercial and residential properties, all administered by a large team of Egyptians. A campaign is under way to stop the property, much of it donated by Jews fleeing after the 1956 Suez Canal crisis, going to the Egyptian state when he retires. In 1937, Egypt's second city had a Jewish community of 25,000. Now it has only one functioning place of worship. The imposing Eliahou Hanavi Synagogue on Nebi Daniel Street had only two men at the erev Rosh Hashanah service this year, Mr Gaon and an American embassy employee. In previous years, a minyan from Israel made the trip for the High Holy Days, but diplomatic relations have deteriorated following Egypt's revolution, and some sources say the group were refused visas. Stored in the synagogue are many precious sifrei Torah. The community also holds genealogical records and other valuable religious and cultural material, all of which may soon go to the Egyptian state. A former cantor at Eliahou Hanavi, 81-year-old Geoffrey Hanson, whose visa to visit Egypt has been refused for the past five years for reasons unknown to him, is on a mission to protect the property, which he estimates as worth 100 million euros. Mr Hanson, who now lives in Israel, suggests a solution: "A group of [ex-pat] Alexandrian Jews must come together and say they will run the community after Mr Gaon." Roger Bilboul, president of the Paris-based Nebi Daniel Association, which acts to preserve Jewish cultural and genealogical heritage in Egypt, is broadly in agreement. "The idea of creating an international committee which can take over is something we have put to the government, but we have never had a response." Bureaucratic stumbling blocks have increased following the revolution, but Mr Bilboul is optimistic. "We need to start knocking on doors, establishing a relationship with the new people in power. We are hoping to start by the end of this year." But the situation in Alexandria currently is "very, very dangerous," says Desiré Sakkal, director of the Historical Society of Jews from Egypt, which is based in New York. This week, there was a fire on Nebi Daniel Street, in which book kiosks were burned, showing the level of anti-cultural feeling in the city. Although he supports the plan in principle, to act now would be "pure madness," Mr Sakkal said. Mr Gaon has himself come in for criticism. His rival for the presidency, Victor Balassiano, wrote an article for the Historical Society accusing Mr Gaon of seizing power and changing the locks on the synagogue while Mr Balassiano was on holiday. He is also alleged to have converted to Islam, something required on marriage to a Muslim woman in Egypt. 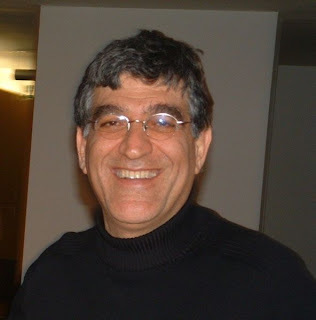 However, Roger Bilboul asserts that Mr Gaon is now divorced, and has documentation affirming his Jewish faith. Additionally, Mr Sakkal said: "Mr Gaon is [allegedly] an appointee of the Egyptian state, so you have to be very suspicious". Ben Youssef Gaon himself was not available for comment. Save Egypt's heritage and assets now! On September 21, 2012, Israel hosted an event at the United Nations highlighting the stories of Jewish refugees expelled from Arab countries in the last century. What? You thought all refugees in the Arab-Israeli conflict were Palestinian Arabs? Nope. The event, "Justice for Jewish Refugees from Arab Countries," featured firsthand accounts from Jewish refugees, along with remarks by Israel's Deputy Foreign Minister Danny Ayalon, Israel's UN Ambassador Ron Prosor, former Canadian Justice Minister Irwin Cotler and Harvard Law Professor Alan Dershowitz. 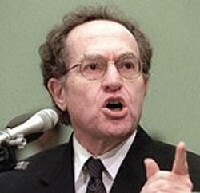 Normally, when Alan Dershowitz sneezes, there's an article in the press. He's been mentioned in The New York Times on literally thousands of occasions. But, when Israel tries to tell the story of the 850,000 Jews living in Arab countries who were dispossessed and forced out between 1947 and 1972, there is virtual media silence. While CAMERA has covered the story of Jewish refugees from Arab countries extensively (see here, here, here, and here), few major media outlets cover the issue and fewer covered the symposium. There was an article in The Washington Times but, other than that, only Jewish and Israeli media covered the meeting. Very rare recording of Zaki Murad, a Hazan (cantor) and his famous singer/actress daughter Leila Murad singing El-Nora Halila, the Sephardi piyyut which opens the concluding service of Yom Kippur. Leila Murad ended her days in Egypt as a recluse, having converted to Islam. I wonder what her father Zaki would have made of that. Wishing all readers observing the Day of Atonement Gmar Hatima Tova. The tragic fate of Palestinian Arab refugees has always loomed over the Middle East conflict. The descendants of those who fled the territory of the newborn state of Israel in 1948 have been kept stateless and dependent on United Nations charity rather than being absorbed into other Arab countries so as to perpetuate the war to extinguish the Jewish state. The refugees and those who purport to advocate for their interests have consistently sought to veto any peace plans that might end the struggle between Israelis and Palestinians. They have refused to accept any outcome that did not involve their “return” to what is now Israel, an idea that is tantamount to the destruction of Israel. The Palestinians have gotten away with this irresponsible behavior because they retained the sympathy of a world that saw them as the sole victims of Israel’s War of Independence. But the historical truth is far more complex. Indeed, not only did Jews lose billions of dollars in property but were deprived of property that amounts to a land mass that is five times the size of the state of Israel. This is something that a lot of people, especially those to whom the peace process with the Palestinians has become an end unto itself don’t want to hear about. They believe that the putting forward of Jewish claims from 1948 is merely an obstacle to negotiations. But such arguments are absurd. Peace cannot be built merely by appeasing the Palestinian claim to sole victimhood. Just as the dispute over territory is one between two peoples with claims, so, too is the question of refugee compensation. Peace cannot be bought by pretending that only Palestinians suffered or that only Arabs have rights. Indeed, such a formulation is a guarantee that the struggle will continue indefinitely since the Palestinians are encouraged to think that they are the only ones with just claims.